Elektro, Lounge, Mondo, Technopops, New-Wave and Bossa Nova with ultra whisper voice. EUREKA! created the ultimate pop music, which sounds in a variety of impressions. 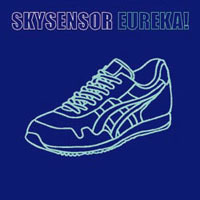 SKYSENSOR is not only the name of the new album by EUREKA!. SKYSENSOR is also one of the most popular high-tech shoes in Japan created 10 years ago. The image of SKYSENSOR stands for "Pinkish Future". Retro-Future and SF world are the theme of this album with 11 fantastic tracks.